…More importantly, how is the CDC defining “chronic disease” so broadly that 60% of us have at least one of them? Is the CDC counting back pain? Tooth decay? Dandruff? Ring around the collar? “The facts,” as the CDC calls them, are only slightly less fatuous. For instance, the CDC counts “stroke” as a chronic disease. Although a stroke is likely preceded by chronic disease (such as severe hypertension or diabetes), it is hard to imagine a more acute medical event than one in which every minute of delay in treatment increases your odds of ending up like the Kardashians. And perhaps the CDC is unaware that Wisk around the collar beats Ring Around the Collar every time. Is 75% (or 86% or 90%) of spending really due to chronic disease? That brings us to the CDC’s third and most curious point. Convention typically attributes more than 80% of healthcare costs to fewer than 20% of people, meaning that costly ailments are concentrated in a relatively small group. The implication would be that, if you address that small group, your savings are disproportionate. Instead, the CDC’s data attributed 75% of costs to about 60% of the adult population, implying almost the exact opposite of the 80-20 rule: The cost of chronic disease is widely dispersed. Indeed, if you remove the rare diseases that afflict about 1% of the population but account for about 7-8% of cost, you come very close to parity between the proportion of the population with chronic disease and the proportion of total health spending attributable to chronic disease. About 59% of the population would then account for about 68% of all spending. You almost can’t get more dispersed than that, according to the CDC’s own figures. Now let’s reconsider this based on the news that chronic disease has increased from 75% to 90% of total spend. That means acute disease spending has fallen 60%– from 25% to 10% of total spend. Shouldn’t this be the headline? Suddenly 60% fewer healthy Americans are replacing joints, having accidents, undergoing operations, or giving birth. Remember, the entire wellness industry and now the entire diabetes prevention industry have sprung up to address this massive amount of what the CDC calls “preventable” costs. In reality, here’s what happens if you strip away the expenses of those chronically ill people unrelated to their chronic condition — like giving birth (which are included in the CDC’s 75%/90% statistics), prevention and management of those conditions (ditto), those aforementioned rare diseases, and unpredictable or uncontrollable exacerbations: that 75% crumbles to about 1-2% of expenses that fit the category of wellness-sensitive medical admissions that could theoretically be avoided with a wellness program. Achieving a 10% reduction in those categories — a feat rarely accomplished, which is why vendors never disclose this figure — would reduce overall spending by 0.2%, or about $12 PEPY before program fees and added prevention expenses are accounted for. This figure was confirmed by the case study published by the wellness industry’s trade association in its official outcomes guidebook. The case study further concludes that wellness loses money, once all expenses are accounted for. Hence, absent the clarion call of the CDC’s math, few employers would ever have bothered with wellness. Instead, the CDC’s claim that 75%/90% of costs were due to preventable disease encouraged employers to obsess with preventing all that “preventable disease” to the exclusion of most other priorities – like, for example, the opioid epidemic. Wellness vendors, charged with keeping employees healthy, totally overlooked this epic threat to employee health in their quest to increase employees’ consumption of broccoli. Opioids are not alone. Many other overused/totally misunderstood interventions also jumped in utilization, with virtually no employee education from most employers or wellness vendors. Spinal fusions, stents, and high-cost scans top that list. Even something as simple as informing employees of the possible adverse events caused by heartburn pills never happened, despite those pills (proton pump inhibitors) being suspected to increase the risk of depression, heart attack, bone fractures, kidney disease, dementia, Vitamin B12 deficiency, bacterial infection, and premature death. So what’s an employer to do…? 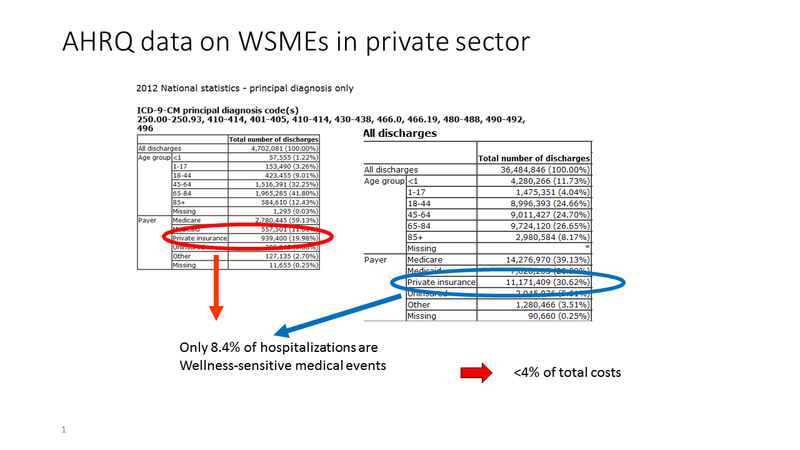 Obviously, it is impossible for a wellness vendor to show savings, given the relative size of the cost of wellness and the relevant claims corpus. It is possible for a wellness vendor to validly show impact, though, as the two validated vendors – US Preventive Medicine and It Starts with Me – clearly do. If impact, and approximate conformance with US Preventive Services Task Force guidelines is your goal, those should be your vendors. Beyond that, seek validated vendors to address some of the remaining 98% of cost, starting perhaps with Quantum Health, which is validated for achieving the greatest amount of cost through voluntary behavior change alone. Behavior change can take you only so far. Talk to your consultant or broker about other opportunities to save money through benefits design change, as laid out in Tom Emerick’s Cracking Health Costs or Dave Chase’s A CEO’s Guide to Restoring the American Dream.